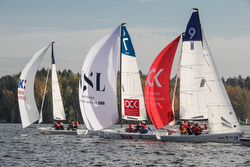 (Moscow, Russia)- A true milestone was recently achieved for the international J/70 one-design class this past weekend. While J/70s have become wildly popular in many countries and regions that were first popularized by the famous J/24 class back in 1977- like Europe, North, Central and South America, Japan, Australia- it is the first time that a “J/Class” has held a national one-design event in what was the principal nation-state of the former U.S.S.R. (the Union of Soviet Socialist Republics)- that is, Russia. Russian sailing has grown considerably in the past decade across their vast expanse in “Eur-Asia”, a country that is bordered on the east by the Pacific Ocean (just 50 miles from Alaska), the west by the Baltic Sea (e.g. the source for Europe’s natural gas), the north by the Arctic Ocean, and the south by the Black Sea (linked to the Mediterranean by the Straits of Bosporus in Turkey). In between are certainly far more than the 10,000 lakes claimed by America’s state known as Minnesota. Given that basic geography, it’s not surprising that an interest in water sports and the sea continue to flourish across Russia. A significant catalyst for that evolution (if not revolution) has been the creation of the Russian J/70 National Sailing League, sponsored and supported by the Russian Sailing Federation. That one idea has brought together sailors from across the spectrum to participate as sailing clubs, generating an enormous amount of camaraderie between sailors from east to west. As the principal sailboat platform, the J/70 has demonstrated to Russian sailors that, literally, every person from young to old, women and men, beginners to Olympic Medallists, can learn how to sail fast, quickly, on the simple J/70. Like their counterparts in Germany and other member countries in the SAILING CHAMPIONS LEAGUE (http://sailing-championsleague.com/), their level of sailing has improved by quantum orders of magnitude in a mere four years of close one-design racing on the easy-to-sail J/70 sailboat. Perhaps the “poster child” of that extraordinary development has been Valeriya Kovalenko, a modest woman sailor from Moscow that has evolved to be one of Russia’s top women skippers. Her team has participated in most major European J/70 events as well as World Championships; their learning curve is steep! For the last two years, she has won the Monaco J/70 Winter Sportboat Series, as well as the YC Monaco’s prestigious PRIMO CUP Credit Suisse regatta in the spring. It is not surprising to see such results; she is fearless on the starting line and will fight for the favored-end amongst the world’s best. 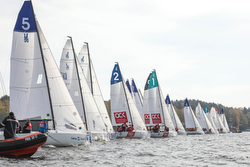 Just this past weekend, the inaugural Russian Open J/70 Championship took place on the lake hosted by Pirogovo YC, just 20 miles north of Moscow. 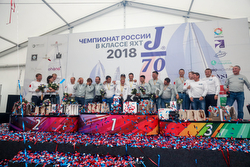 It was a first for Russia, a first for the J/70 Class, and a first for World Sailing, to have a Russian national championship sailed in a recognized international class where two dozen (yes- 24 boats!) teams competed for national class honors. Here is a summary of what took place on this historic weekend for a total of FOURTEEN races in just three days (my goodness the crews must’ve been exhausted or dizzy from going around the race track so many times!). It was a great start for the crew of Dmitry Šunina as they managed to post an 11-2-3-3 to give them a total of 19 pts at the end of the first day to top the leaderboard. Just behind them by three points was a leader of the J/70 class in Russia- Denis Čerevatenko- who’s team collected a 5-8-5-2 for 22 pts. Then, sitting in third only one point further behind was Team GLEB FETISOVA with a tally of 5-5-11-1 for 23 pts total. Details and results. After starting out the first day with a 6-10-14-1, it was clear Valeria Kovalenko’s crew on ARTTUBE RUS-1 had to get their “mojo” going. After their post-race analysis on what to do, they managed to do exactly that on the five-race, very exhausting day two. Their record speaks for itself, posting an incredibly consistent 3-3-1-3-4 to rocket up the standings and sit atop the leaderboard with a comfortable lead. Starting out in the silver position on the first day, Denis Čerevatenko’s crew held onto their standing with a strong 8-1-2-6-1. Then, after two days of racing and nine races, it was the Alexandra Peterson Collective Team that jumped into the third position. WOW, it was an enormous game of “snakes & ladders” for everyone, including the podium finishers. Yet, things were going to get even more interesting for the final day. Details and results. Given more good winds, but quite shifty, as they had been the day before, the protagonists in the Russian J/70 Nationals at the top of the leaderboard did not change. In the end, after posting a closing tally in five more races of 16-1-1-1-2, it was the ARTTUBE RUS-1 Team that won by over 20 pts after 2 discard races. 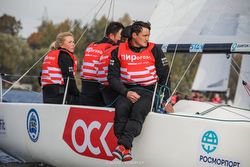 Valeria Kovalenko’s team of Igor Lisovenko, Alexander Božko and Denis Rozhkov were declared the first Russian J/70 National Champions! Closing with a 1-4-14-15-6 tally to take the silver was Denis Čerevatenko’ team. And, taking the bronze with an amazing closing scoreline of 14-2-4-3-1 was the team of Zoran Paunoviča. Details and results. Follow the Russian J/70 National Championship photo album on Facebook For more Russian J/70 National Championship sailing information Add to Flipboard Magazine.